Brace yourselves ... "Dewitos" are coming. On Friday, PepsiCo announced that it has successfully (?) developed a new Mountain Dew flavor: Doritos. Dubbed "Dewitos," the beverage will attempt to mimic the nacho cheesiness of every stoner and seven-year-old&apos;s favorite snack. "We are always testing out new flavors of Mountain Dew, and giving our fans a voice in helping decide on the next new product has always been important to us," a spokeswoman for PepsiCo told the Huffington Post. 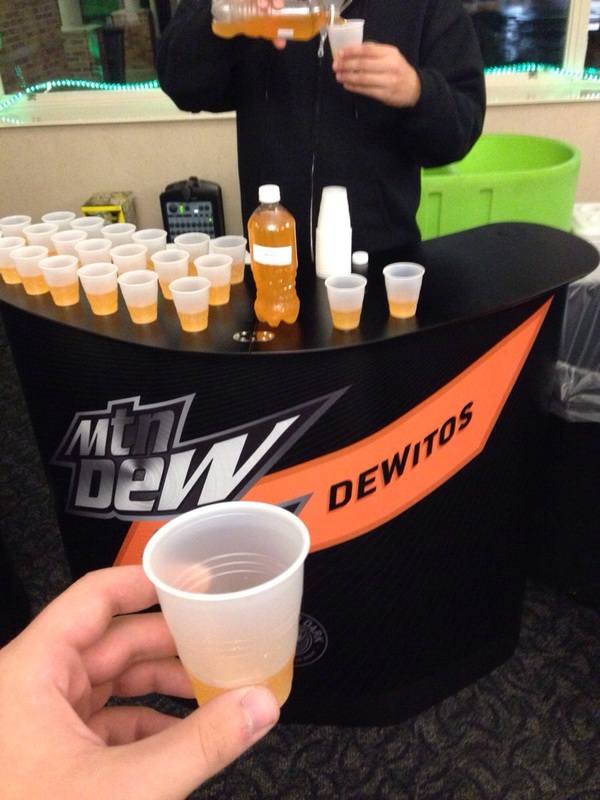 "We opened up the DEW flavor vault and gave students a chance to try this Doritos-inspired flavor as part of a small program at colleges and universities." One such student, reddit user joes_nipples, posted a photo of the concoction to the subreddit r/pics. The user reported that it did, in fact, taste like Doritos, though if the top response ("I think I just vomited a little") is any indication, PepsiCo has a fair bit of marketing to do if they ever foist Dewitos upon the rest of the public. "It honestly wasn&apos;t that disgusting. It tasted like orange with a Doritos after taste. It tasted like straight Doritos afterwards though. Weirdest thing I&apos;ve ever drunken," the user wrote. As the Huffington Post noted, the company has a habit of combining the two snacks. In 2008, for example, they released Doritos Quest, a "mystery" chip whose secret ingredient was later revealed to be Mountain Dew. Somehow, though, the thought of drinking a nacho-flavored beverage — versus eating a Mountain Dew-flavored chip — seems much worse. Given that the target audiences for Doritos and Mountain Dew are more or less the same, it&apos;s almost surprising that the combination didn&apos;t arise sooner. Of course, that doesn&apos;t mean it&apos;s a good idea. As Gothamist&apos;s Ben Yakas sagely pointed out, "Some people really do just want to watch the world burn." It&apos;s yet to be determined whether Dewitos will ever make it all the way to your grocery store&apos;s refrigerator, but you can bet that if it does, Mic will be there to taste test it.